A luxury complex of 6 villas with Private Pools overlooking the ocean and the beautiful complex of Progiponisia Islands, Scorpios island, Sparti, Madouri, Scorpidi, Meganisi Islands & the Ionian Sea. 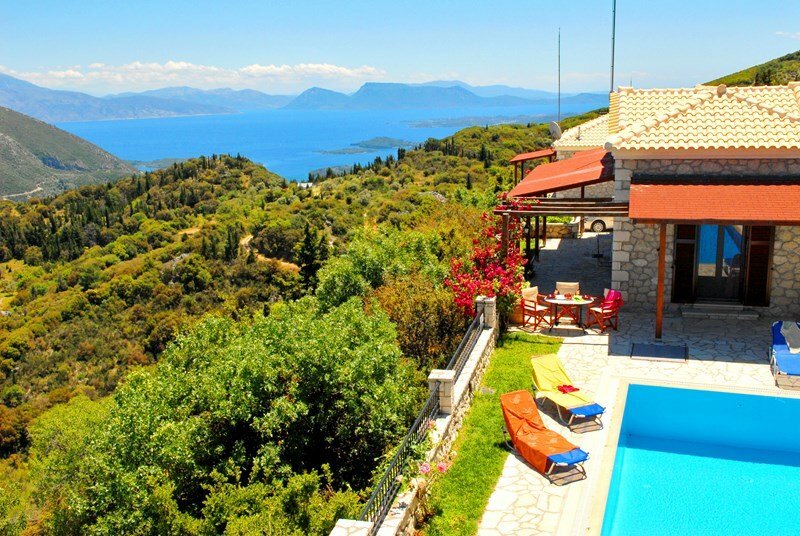 Lefkada Villas complex consist of five luxurious villas in village Vafkeri. Each villa can offer hospitality for 4-6 persons. Lefkada Villas / Vafkeri are situated at the village Vafkeri and offer spectacular view at the sea of Nidri and the island Scorpios. The picturesque mountain settlement of Vafkeri is located in the center of mainland Lefkada. It is a very scenic village, with stone-built houses and beautiful green verdure. The view from Vafkeri village, of the shimmering sea of Nydri and Onasis' "Scorpios" Island, is magnificent. In Vafkeri village, you will find the peaceful holiday spot you have been seeking. From Italy : Venise, Ancona, Bari or Brindisi to Igoumenitsa or Patras. Vafkeri is a small mountainous village in the centre of Lefkada. Built at an altitude of 500m, this village has traditional architecture and many renovated stone buildings. The route from Nydri to Vafkeri is idyllic, with wonderful view to Meganisi, Skorpios and the other small islands between Lefkada and mainland Greece.